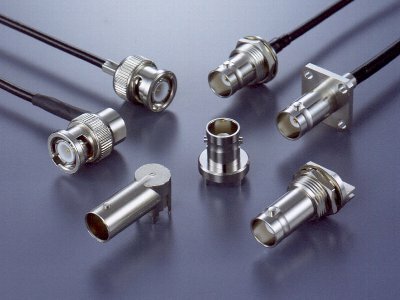 BNC Series | Japan Aviation Electronics Industry, Ltd.
BNC series are small size coaxial connectors, conforming to the general purpose standards (IEC60169-8). Easy to operate bayonet lock, best suited for connection between indoor devices, involving frequent connecting and disconnecting. Applicable frequencies: from DC up to 4GHz(50ohms)/ DC up to 2.4GHz(75ohms). High performance with a V.S.W.R. (Voltage Standing Wave Ratio) of 1.2 or less (DC-3GHz). A wide variety of products enable various mounting styles. Two impedance models are available: 50 and 70ohms. A high degree of reliability provides stable electric continuity and high frequency performance. Applications: Broadcasting equipment, Various audio-visual equipment, Measuring Instruments In addition to independent cable application type, we also harness products which satisfy your specification are available. center contacts: 10 milliohm max., outer contacts: 5 milliohm max. (Note) We recommend that you couple connectors with the same impedance (50ohm to 50ohm or 75ohm to 75ohm).